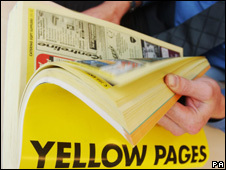 Trading continues to be "challenging"
Yell Group, the publisher of Yellow Pages in the UK, has announced plans to raise at least £500m by selling more shares in order to cut its debts. The company, whose debts stood at about £4bn in June, also said it planned to reduce debts by a further £300m over the next 18 months. The firm has been in talks over a refinancing package since June. Yell has been hit by the advertising downturn in the recession and it said trading remained "challenging". John Condron, chief executive of Yell, said the progress made in refinancing the company "reflects the recognition of the robust and cash generative nature of Yell's business model, which continues to show resilience relative to other media despite the current economic challenges." The firm said its plans had received indications of support from a "significant proportion" of its main lenders. Yell added that its current trading was in line with expectations, with second-quarter revenues expected to be 17% lower than a year ago. Revenues in the third quarter are set to be down 16% from last year.